I would be completely lying if I said that I didn’t occasionally face a writing deadline that inspired a low-level, if not completely outright, panic attack. That is simply the life of a writer. However, thinking back to how I manage deadlines now as compared to how I handled them when I first started Grammar Chic, I have to say that I employ a completely different process. I am an organized person by nature, but I also realize that not everyone counts that particular characteristic as one of their strengths. Lately, I have been grooming two of my new writers on the tenets of how to work under deadline. To a new copywriter, this can indeed seem intimidating, especially when coupled with the fact that I ask my writers to work remotely and, therefore, have strong independent working and time management skills. This is a skill that has to be learned for many and acted upon regularly. The thing about deadlines is that they have the ability to stretch and modify themselves based upon the time allotted for a project. For instance, if I said to myself, “I have two weeks to write this chapter,” I can guarantee that I would be able to stretch the writing for said chapter across two weeks. However, if I said, “I have two days to finish this chapter,” my sense of urgency would be accelerated and I would write faster, get the job done and cross that particular task off my to-do list, allowing me to move on. I fear that many writers, especially when starting work on a freelance basis, lack some of the time management skills and deadline-driven mentality that are necessary when considering what you are able to charge for a project, how long it takes to complete and where your profit margins lie. This basic business principle is often ignored by creative sorts and, ultimately, it hurts their ability to be profitable. I have spoken about the job board that handles all Grammar Chic internal deadlines before. And frankly speaking, we don’t deal with monthly or weekly deadlines, but daily deadlines. Moreover, I can tell you that my experienced and tenured writers have thrived in this environment and there is little question that if something is due today, the client will receive it on schedule. As you begin, keep in mind this idea, “Don’t get it right, get it written.” Too often, writers obsess about how to begin, trying to grasp the proper opening and agonize to the point of obsession, ultimately playing the biggest head game with themselves that they talk themselves out of working. If you can’t commit a thought to paper, how do you expect to be profitable? Get writing and worry about editing and honing your thoughts later. The clock, as they say, is a tickin’. Get in the zone. Turn off your cell phone, stop checking Facebook and only use the Internet for work-related information gathering. Live and die by a schedule, editorial calendar or even a simple to-do list. This is important; studies show that individuals who write down their goals are more likely to achieve them. It’s hard to ignore a deadline when it is staring you in the proverbial face from the to-do list on your desk. While Grammar Chic operates on a company-level through our networked job board, I can tell you that each and every day I write down everything that must be done in order for me to call it quits. And you know what? It works. I consider everything on my list non-negotiable. No matter if it is answering an email from a client, returning a phone call or completing a project. Designate an area of your home (if you work from home that is) that is decidedly work focused. If you are trying to succeed as a writer, you cannot write from the comfort of your bed, or while sitting on the couch watching TV in your pajamas. 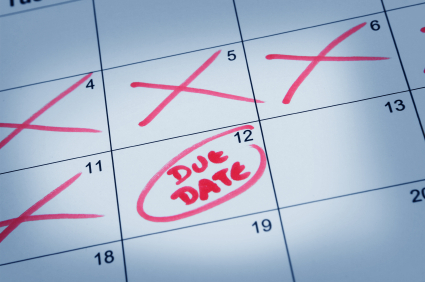 You will never meet a deadline if you have a casual attitude toward your work environment. Organize everything you need for your project. This comes in the form of either hard copy information or data found on the Internet. If it’s hard copy data, make sure it is in front of you. If it is Internet-based data, make sure you can succinctly and efficiently jump from one webpage to the next without having to do multiple Internet searches. This is where bookmarking websites comes in handy. Outline your schedule working back from the deadline date. This is especially useful if you are dealing with a deadline that has multiple steps but doesn’t work so well if you are producing a page of copy that is due by COB. If the project is intensive, identify and highlight the steps that go into completing the piece, i.e. due date, revision date, draft due date, workspace organization, information gathering. Working back from the due date is effective for me when I engage in large scale manuscript projects. Do not interrupt your writing process with overthinking. I have been coaching my newer writers on this point in particular. Oftentimes, a new writer will want every single point they discuss to be examined and broken down to the nth degree. This is a recipe for disaster. In the world of copywriting in particular, to be too specific means that you lose the reader and, since people nowadays tend to suffer from ADD, you must write in a way that will leave the reader wanting more, which inevitably leads them to click to the next page, fill out a contact form, etc. To be too specific allows a reader to disqualify themselves, or get distracted and bounce off the website. And from the perspective of a writer, to be preoccupied with minor points means succumbing to the time vampire that is always peering over our shoulder. Avoid overthinking and the agonizing that comes with it and realize the ability to stay on task. Time out how long each part of the project should take. “It is going to take me two hours to write this section, one hour to do the next part and 30 minutes to draw up the conclusion to this web copy.” However, it is not enough to simply say this to yourself; you have to stick to it. If you find yourself running out of time, stop whatever you are doing and refocus your efforts. For instance, if suddenly you went off on a tangent and realize that you require more research to finish the point, back it up, reorganize what you were writing and focus on your main topic. If you really need to stay on task, put a timer on your desk and live by it. Trust me, this will become second nature. Engage in a healthy level of panic. Without a sense of urgency, nothing would get done. I realize that there are times when the deadlines I impose on myself are not my client’s but my own, and regardless if it is my psyche breathing down my neck or that of the client waiting for me to send them their work, it inspires me to get it done. Even if your client is flexible, set a deadline that you consider inflexible. Wake up in the morning and just know that what you are doing that day is honoring that deadline. Your client will appreciate your ability to follow through and deliver, the work will get done and your business will flourish. The team at Grammar Chic specializes in a variety of professional writing and editing services, including resume, LinkedIn profile and cover letter writing. For more information about how we can help you, visit www.grammarchic.net or call 803-831-7444. We also invite you to follow us on Twitter @GrammarChicInc for the latest in writing and editing tips and to give a “like” to our Facebook page. Text GRAMMARCHIC to 22828 for a special offer. I’ve enjoyed what I’ve read on this blog so far, but this post in particular tempts me to print it out and keep it posted on my desk. As a creative writing student, aspiring author, and experienced copywriting intern, these tips are more like commandments that I’ve seen again and again. Never hurts to get a reminder, though. The first one – writing to get words down without focusing on perfection – is especially good advice that needs to be engraved in stone somewhere. This was one of the biggest focuses of my college writing program, and simple as it sounds, this is one of the easiest rules to break. The first time I saw how much I could get done by silencing my internal editor, I was awed. Turning it off gets a little easier each time afterward. The fourth tip – writing in a designated, distraction-free space – is the one I tend to forget most often. You don’t realize at first what a huge psychological difference it can make whether or not your other hobbies are readily at hand, but just leaving the room they’re in can have a profound effect on productivity. I think this is why so many people take their laptops to coffee shops – it’s a relaxing environment, but at the same time, you don’t have to deal with the siren call of TV, video games, that book you were reading, etc. Overall, this is powerfully useful advice for any writer, copy or otherwise, no matter how many times or in how many variations it’s given.